Now, I released Safari Extension that show preview image from instagr.am on #NewTwitter. Chrome Extension is also exist, but it so unstable, I don't publish yet. If API will unveiled, it maybe more stable. Maybe you could put the location of the photos somewhere in headers when someone requests the shorturl? It would save some time from having to do the API sooner and allow people to derive the photo's url from the short url. and be able to grab the custom set header (you could even do just a 302/location header if someone was just doing a HEAD request). Would love to develop a webOS Instagram app! If an API were available, I would definitely jump on this. I want to use api that similar vimeo's one. #NewTwitter uses this api as below. then #NewTwitter uses "html" which contains iframe. 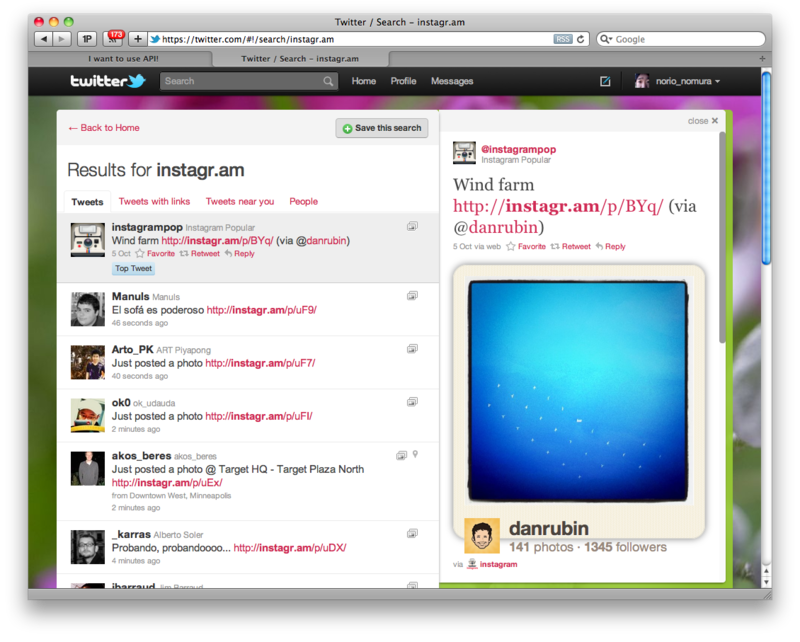 I updated Safari and Chrome extension that showing Instagram preview in Twitter. I noticed that http://instagr.am/ returned frequently status 404 with regular contentText . I would love to have a streaming and search API so I can build geo-photo montage. I'd like an api for inter-application communication on the iPhone. So other photography apps can connect to instagram's sharing and photo processing capability. The best implementation I can imagine of this is to use the pasteboard. E.g. My app puts the image in the pasteboard, opens instagram (with a url like "instagram://incoming.paste/callback_url=myapp://instagram/status_code=") to a paste screen, which automatically grabs what's in the clipboard. If we could send things like an image title, or tags to go along with the image, all the better. I currently have two photography apps in the app store that would benefit greatly from this kind of a feature. Apps can check if instagram is available using UIApplication's canOpenURL: selector, and show a dialog which offers to send the user to download instagram if they don't have it yet. THINK ABOUT IT DUDES! IT WOULD BE AWESOME! case in point for awesome instagram integration. Nice, I've been thinking of building an instagram stream using anything posted to twitter's stream. What's your method? @mention me on twitter at @zacwitte to chat. Can we handle this as Public API? Why doesn't Instagram just publish open tables for use via YQL? That way you just query Yahoo for the data and it would work for any custom requirement. API in beta apparently, I applied just waiting to hear back.